Promenade Portland, Assistance League of Greater Portland’s fashion show, put the spotlight on local boutiques to a crowd of 345 guests at the Multnomah Athletic Club on April 9, 2018. Walking the runway were member volunteers from the nonprofit and its Advisory Council. 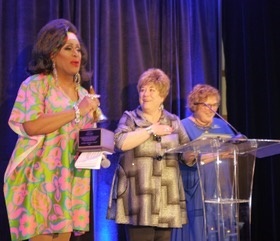 Dressed in a spring floral dress, local entertainer Poison Waters was the emcee for the event. Seven local boutiques provided fashions for the show, including Adorn, Monique’s Boutique, Janelle James Boutique, Paloma Clothing, Garnish, Rachelle M Rustic House of Fashion, and Union Rose. Fashions from Assistance League Thrift Shop were also featured. Another highlight of the event was the presentation of the National Operation School Bell® Award, to the emcee, Poison Waters. This award is to honor someone in the community who, through significant financial, in-kind or service support, have had a direct, powerful and positive effect on Operation School Bell. The event grossed $143,000 for the local chapter of Assistance League and its community service programs. Assistance League of Greater Portland, celebrating their 20th year of clothing children through their flagship philanthropy, Operation School Bell, clothed 4,041 children in Portland, Beaverton and Hillsboro this school year. We have seen a huge growth in our program since the first year, in which we gave jackets to 38 students. Sponsoring the event were O’Donnell Law Firm, LLC, Albina Co., Inc., NW Natural, US Bank, Silver Lining Jewelry, Alaska Airlines, Porsche Beaverton, Audi Beaverton, Fred Meyer, Dustin Funes of the Meadows Group Inc., Realtors, Seams to Fit, and PacTrust. Local merchants also donated generously for the live and silent auctions. Assistance League of Greater Portland has been improving lives through community-based programs since 1965. Assistance League member volunteers provide five community service programs. The programs serve local families in need by providing new school clothing, enrichment activities for troubled youth, personal history books for foster and abused children, emergency clothing for assault victims and a scholarship program. In addition to grants, sponsorships and donations, funds are raised at Assistance League Thrift and Consignment Shops at 4000 SW 117th Avenue in Beaverton.